The abandoned mine where American troops discovered a treasure trove of art and artifacts hidden by the Nazis. Near the end of World War II, as the Allies were fighting to suppress fascist forces across Europe, groups of American troops who came to be known as Monuments Men had a different mission: finding and rescuing precious European art and artifacts that the Nazis had hidden in various locations to protect them from air raids. As part of this mission, in April, 1945, American soldiers trekked their way into Hainer Stollen, an old mine shaft in Siegen, Germany, that had been repurposed as a bomb shelter. The Americans found an entire community of people hiding there, as well as a treasure trove of paintings and royal artifacts, altogether worth 3 to 4 billion gold marks (almost $1 billion). The troops, accompanied by art historians and restoration experts, discovered a collection that included the relics of King Charlemagne, several paintings by Peter Paul Rubens, artifacts from the treasury of the Aachen Cathedral, the original manuscript of Beethoven’s Sixth Symphony, and hundreds of paintings and sculptures. Before handing the artifacts over to the relevant authorities, the troops posed with the crowns and scepters, enjoying the feeling of being royal for a few minutes. The work carried out by these troops and others like them made its way onto the silver screen in the 2014 film Monuments Men. 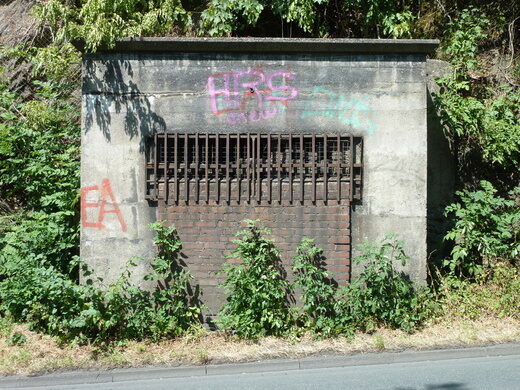 The cave has since been closed up, but its entrance can still be seen along the side of the road. Lots of webpages give the wrong address. 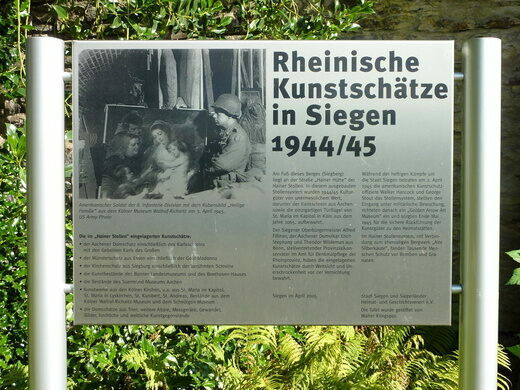 The correct location is the one listed here, along Hainer Hütte in Siegen. Commemorating a unique medieval profession: men who collected feces. An oversized, oddly designed pedestrian overpass has drawn comparisons to a commode for pachyderms.